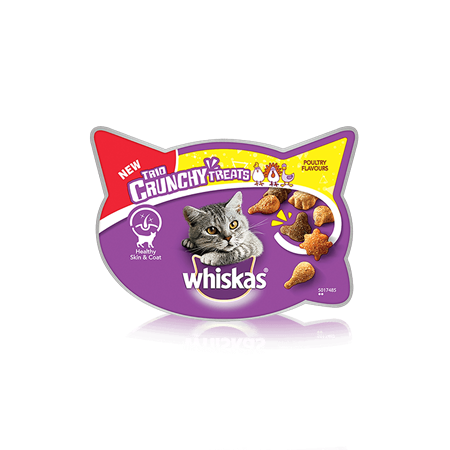 WHISKAS ® Trio Crunchy Treats Poultry Flavours is rated 4.8 out of 5 by 101. Rated 5 out of 5 by Dspalton from Great to give when you leave the house Lovely crunchie treats for our four legged friends that go down well when heading off to work. Rated 5 out of 5 by Amy14 from Amazing product I bought these for my cat a few months ago. He absolutely loved them and he is very fussy with food which just goes to show how good these treats are. Rated 3 out of 5 by Snixx94 from It was good This was good for one of my cats as he couldn't get enough of it. The other is quite picky so I get why he snubbed. Would buy again though. Rated 5 out of 5 by Colin from Great as ever! I don't think my cat has ever refused any of the treats that come in the little 'snack pot' range and these are no different. I was amused by the fact they bother to shape them like little chicken drumsticks but the cat was just concerned with taste and these were incredibly popular. I usually mix a couple in with the regular Whiskas "Tasty Filled Pockets" biscuits handful I put down at bedtime (to tide him over till breakfast and try to prevent early morning wake-up...). Rated 5 out of 5 by Rachel1234 from awsome little treat! My cat loved the poultry flavoured treats from Whiskas - she loves her poultry and this was a good way of giving her something as a bonus whether she is good or not - all in moderation and after the third time giving them to her she recognised the sound of the tubs - little minx! A shower of meows until we gave in giving her some even if just moving the tub out of the way! Healthy and tasty based on her reactions highly recommended! Rated 3 out of 5 by Sr77 from Great at first My cat seemed to love these treats at first and ate what I gave her but after a few days she'd leave a few and now she isn't interested. She seems to prefer treats with a filling. Cereals, Derivatives Of Vegetable Origin, Meat And Animal Derivatives (Including 1% Turkey, 1% Duck, 16% Chciken), Vegetable Protein Extracts, Oils And Fats, Minerals, Yeasts.